I love the cat guard on the easy chair. I put a selection of my stretchy bracelets (made with rubber rings and AA) in a bin near the front of my table and people seem to enjoy handling those and looking at everything else at the same time. Thanks, that's the type of information I'm looking for. Anyone else have information? I'm just dying of curiosity to see the end results, but I don't want to be pushy... has there been any word on this yet? My hair is down to my fingertips and getting longer. I usually keep in a braid to keep it untangled. Here is the completed headdress...my mind is already thinking of variations. How about hug them, and pet them, and squeeze them and call them George? That's what I do. Glad I'm not the only one who likes to anthropomorphize his rings, Bernice! The best I can think of with the books I have, is a variation on the Olivia weave. Here is my entry. 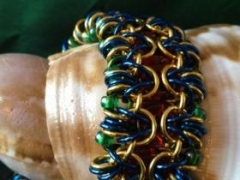 A bracelet made using The Ring Lord's glass donuts. I used 18 gauge - 1/4", 3/16" and 5/32" with the red glass donuts and green beads. Bracelet made using The Ring Lord's glass donuts. I have started using Project Wonderful for advertising on other sites. It's easy to use and I have gotten views on Etsy by people clicking on my ads. I also put a post on my local meetup site (where I sold 3 items to a local). Otherwise, I have found that periodically adding new items adds to my views.